Federici Video has the video technology you need on hand and ready to implement. Our location package is perfectly suited to shooting in the corporate environment and meets the highest broadcast quality standards for camera, lighting, audio and monitoring. Our post-production facility features Avid Media Composer and Final Cut Pro with uncompressed editing in all video formats, including full HD with 3D effects, intraframe editing, color correction, and advanced audio processing. Our Graphics Workstation runs After Effects, Motion, and Live Type with many plug-ins and third party app's to round out the palette of effects. 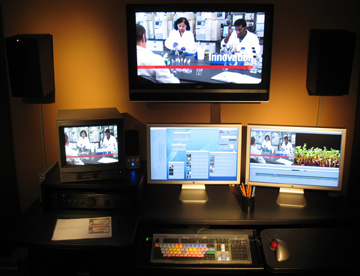 Compression, streaming, DVD authoring and duplication are all available in-house.